Pope Francis is scheduled to celebrate Mass on an enormous scale Sunday, with 2 million people expected to gather on a mile-long parkway in downtown Philadelphia. And nearly 1,500 priests and deacons will be on hand to help distribute Holy Communion. In Communion, Catholics receive bread and wine. The church teaches that when the bread and wine are consecrated by an ordained priest, they become the actual body and blood of the risen Christ; a theological explanation for this process, known as transubstantiation, has been supported by official church teaching since the 16th century. The Catholic Church has a variety of rules and guidelines about who can receive Communion. For example, only baptized Catholics are eligible to receive Communion. If a Catholic is conscious of having committed a “grave sin” – for example, divorce or cohabitation with a romantic partner outside of marriage – he or she must first repent and perform penance for that sin before being eligible to receive Communion. 1 The church recommends that Catholics receive Communion every time they attend Mass, and about four-in-ten Catholics (43%) say they do so. Overall, 77% of Catholics report taking Communion at least some of the time when they attended Mass, while 17% say they never do so. 2While Hispanic Catholics are as likely as white Catholics to attend Mass weekly, Hispanic Catholics are much less likely than white Catholics to say they regularly receive Communion. 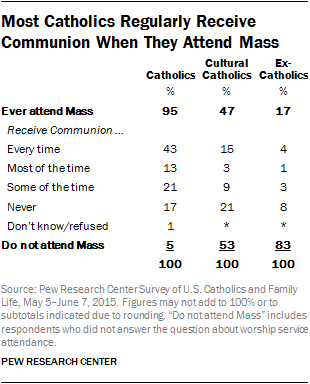 Only 21% of Hispanic Catholics receive Communion every time they attend Mass, compared with 56% of white Catholics. About a third of Hispanic Catholics say they take Communion only some of the time they attend Mass (35%). And roughly a quarter say they never receive the Eucharist (27%). 3Catholics who currently are cohabiting or have divorced and remarried without seeking an annulment (and thus are presumably ineligible to receive Communion) receive the sacrament less frequently than other Catholics. However, roughly two-thirds of Catholics who are cohabiting or divorced and remarried still do participate in the rite at least some of the time. Indeed, 34% say they receive Communion every time they go to Mass, 7% say they accept the sacrament most of the time and 23% take Communion some of the time. 4About six-in-ten Catholics say the church should allow divorced Catholics who remarry without getting an annulment to receive Communion. This is about the same as the share who say the church should allow cohabiting couples to receive Communion (61%). 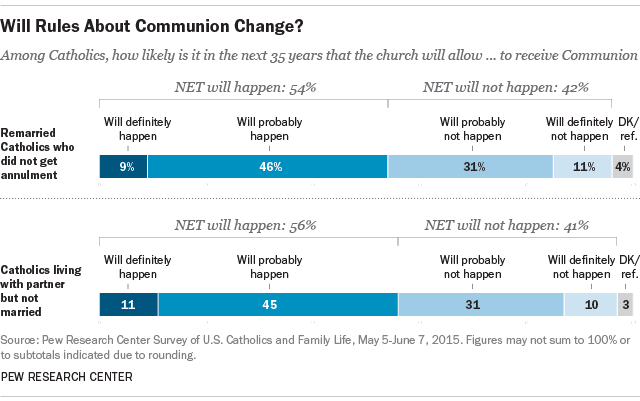 5Many Catholics believe the church will change its rules on who can receive Communion. Indeed, 54% of Catholics say they expect the church to allow divorced Catholics to receive Communion in the next 35 years or so. A similar share also says cohabiting couples will be permitted to receive Communion in the next 35 years (56%).